Happy Belated Thanksgiving! 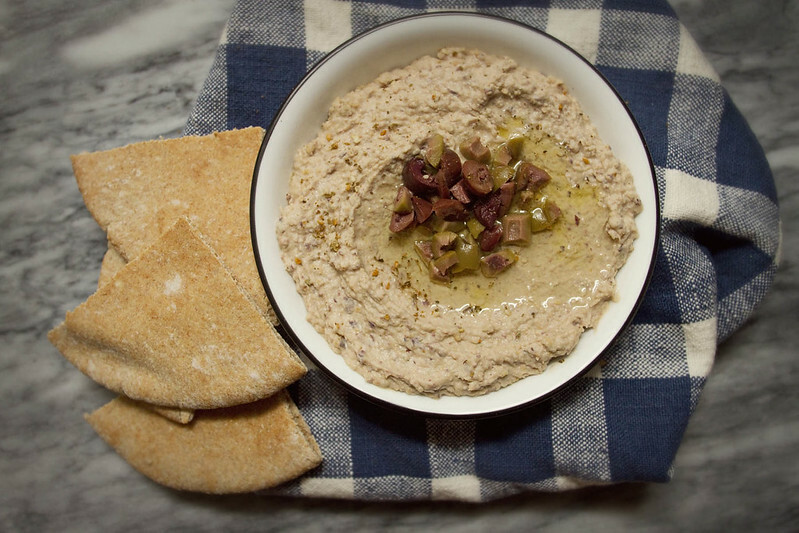 I was buried beneath a mound of potatoes, brussels sprouts, cranberries, and turkey yesterday but I managed to dig my way out to bring you this lovely hummus recipe. It's the perfect snack or light lunch to diversify from the leftover turkey that currently fills my fridge. This is a fairly large recipe, and would also make a lovely appetizer at a party or get-together. 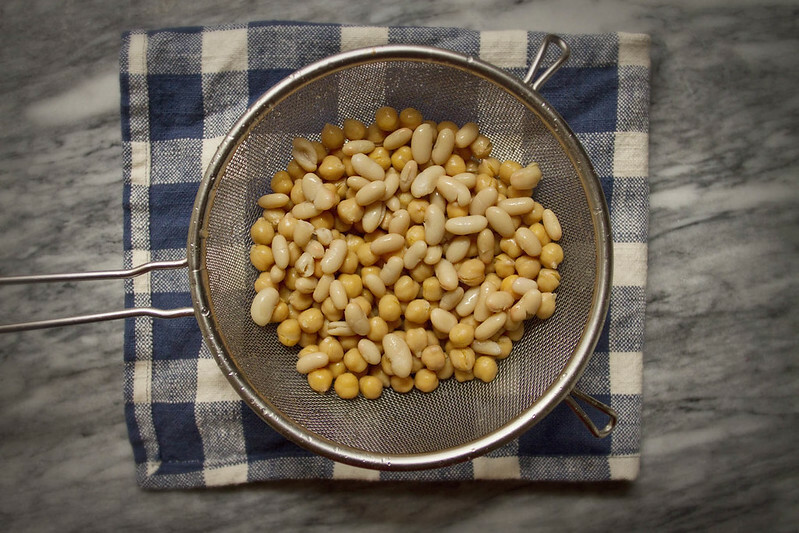 White beans are a fabulous addition to hummus- they're lower in fat than garbanzo beans, and they are super creamy when smashed. 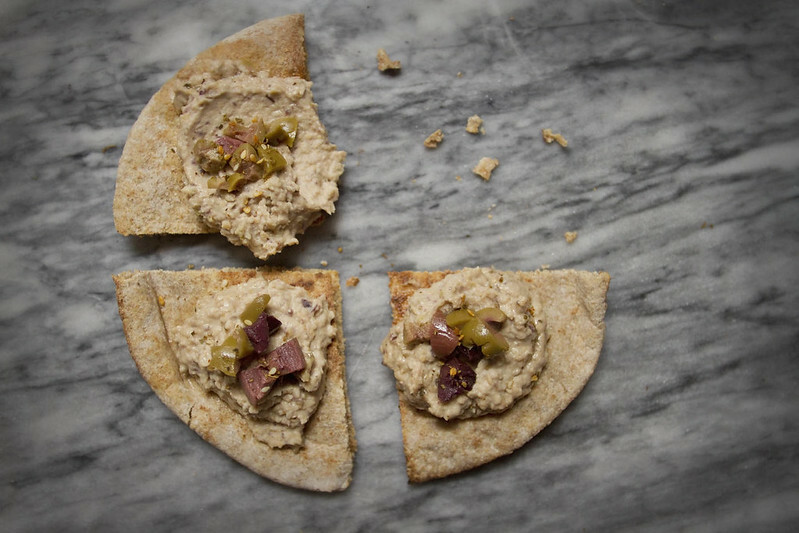 The olives add a tangy, slightly salty twist to the creaminess of the hummus. I love olives. 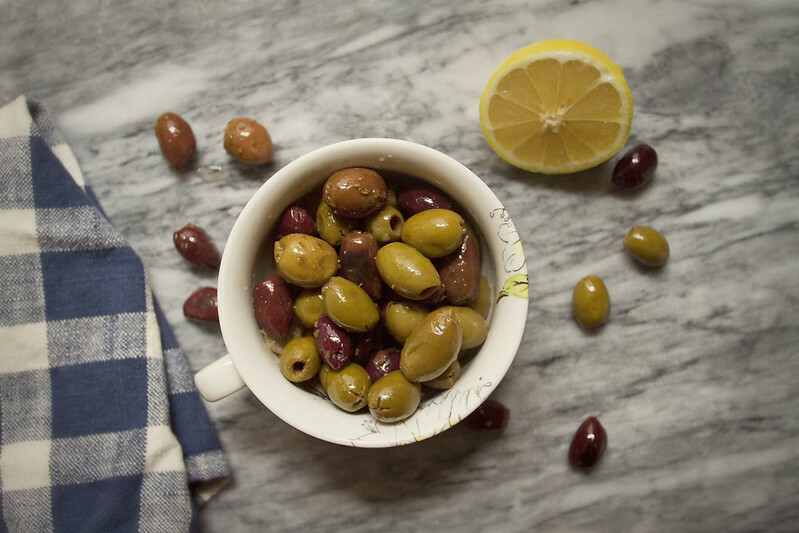 When I was a kid my father would take me to the West Side Market in Cleveland and we would stop at the pickle and olive stand, for some oily purple-black kalamata olives which my parents enjoyed with red bell peppers and olive oil on pasta. I preferred to eat the olives plain, or alongside the little stuffed pickled eggplants also sold at the stand, making an oily mess of my little hands. I used a mixture of pitted kalamata and green greek olives, but I think using one type would also work just fine. 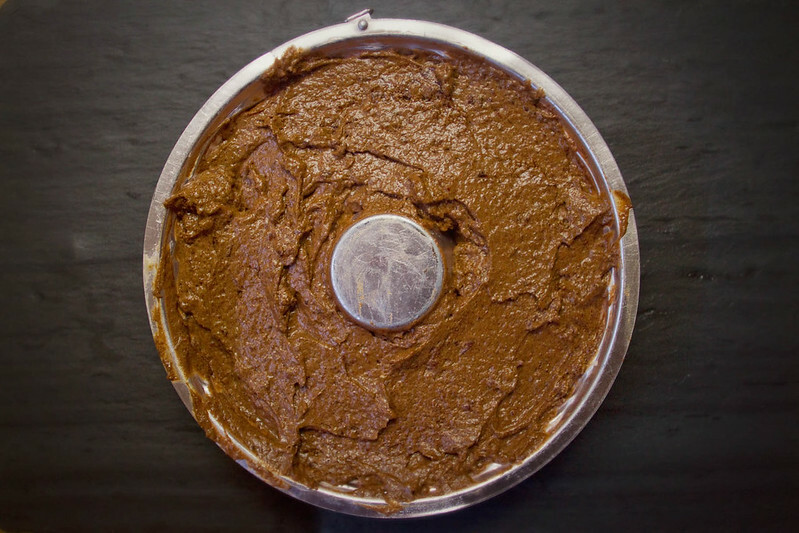 Kalamata alone would probably produce a pale purplish red hummus, which might be nice at a festive party. 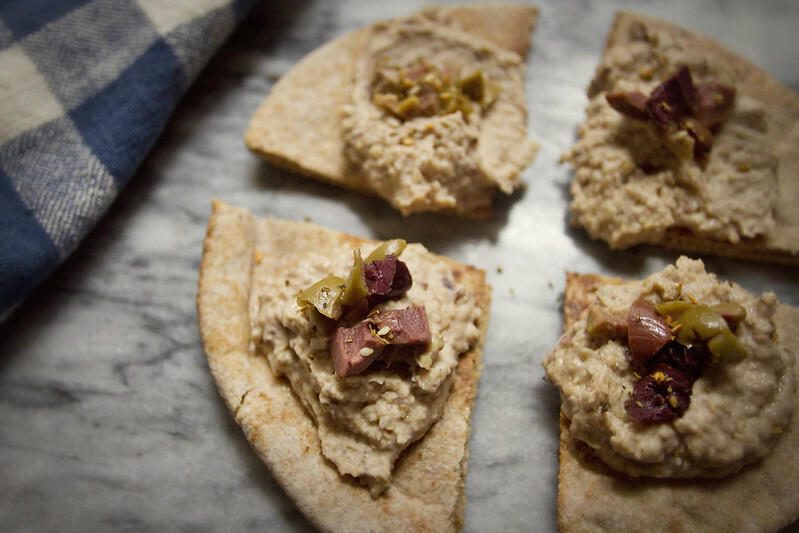 I spread some of my hummus onto toasted pita quarters and sprinkled them with chopped olives and za'atar for a nice finger food appetizer. Open cans of beans, drain and rinse thoroughly under running water, add to food processor with lemon juice, garlic, olive oil, tahini, 3/4 chopped olives, and 1 tsp za'atar. Blitz until hummus reaches desired smoothness, between 2-5 minutes. Chop remaining olives fairly fine. 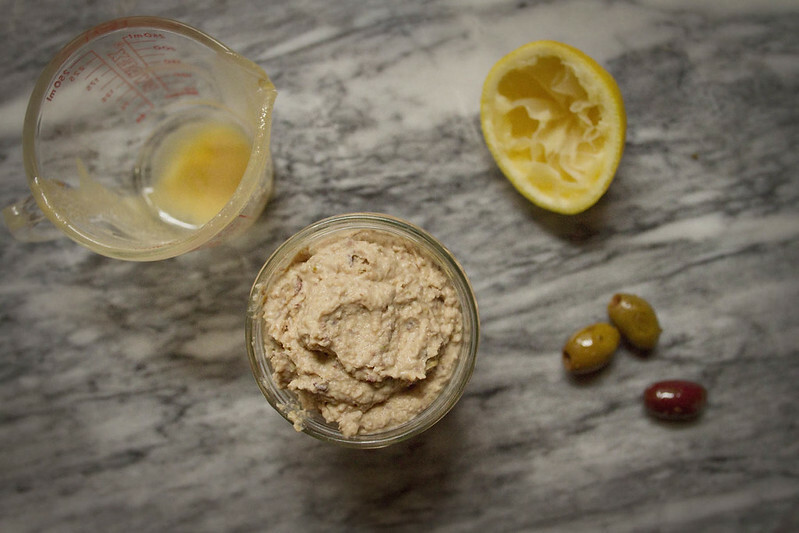 Scoop hummus into a large bowl, smooth out the top, drizzle on additional olive oil, and top with chopped olives and sprinkle with remaining 1 tsp za'atar, if using. Serve with warm pita, carrot or celery sticks, or other desired dipping food. I baked this cake on Sunday, and when it was done I opened the oven, bent down to remove it, inhaled deeply, and was immediately thrust back in time to my childhood in Ohio, and biting into fresh gingerbread smothered in apple butter at Christmas in Frostville. Frostville is one of those living museums, a historic town preserved in valley park, and at Christmastime one can come down and tromp over the snow covered fields from preserved house to preserved cabin and learn about Christmas traditions throughout American history. One house is always baking gingerbread, and it has long been my favorite. It's a small house, the gingerbread bakes in a wood burning oven in the kitchen, but the smell permeates from the back porch straight through into the teeny tiny bedroom. 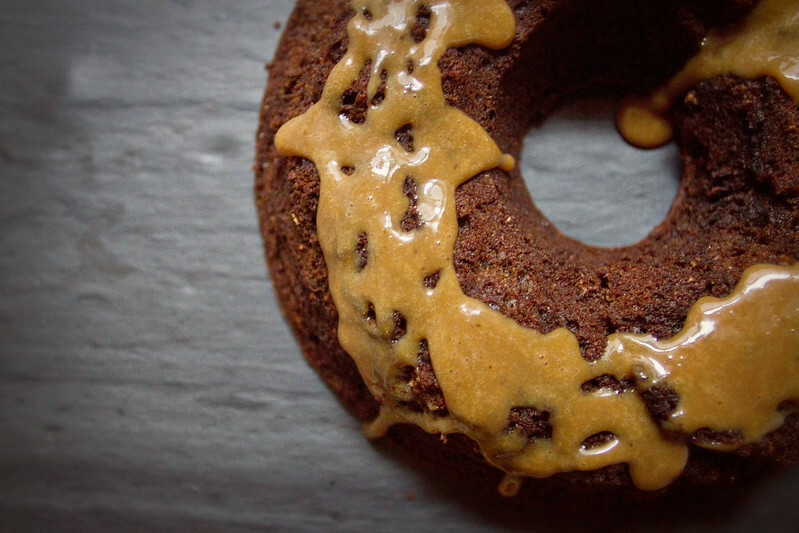 It's warm and rich, dark, cinnamon-ginger-y, with a heavy taste of molasses. However, snacks are not served in the historic houses, so while you tour the house, your mouth watering, you dream of the barn, where the snacks are waiting. There is hot apple cider, frosted sugar cookies in the shapes of candy canes and gingerbread men, and of course, there is gingerbread and apple butter. 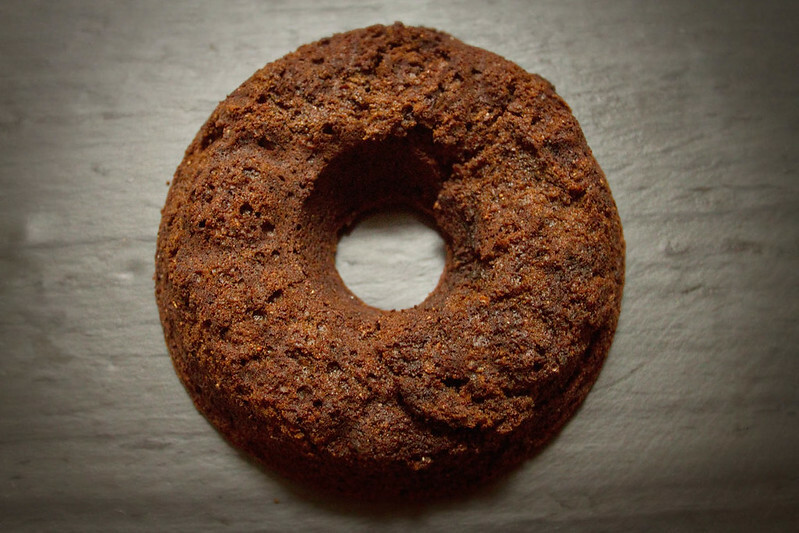 Biting into that thick layer of sweet apple butter atop spicy, complex gingerbread was emblematic of the entire holiday season to me as a child. The gingerbread I present to you today is my attempt to match that experience. This gingerbread is luxurious. 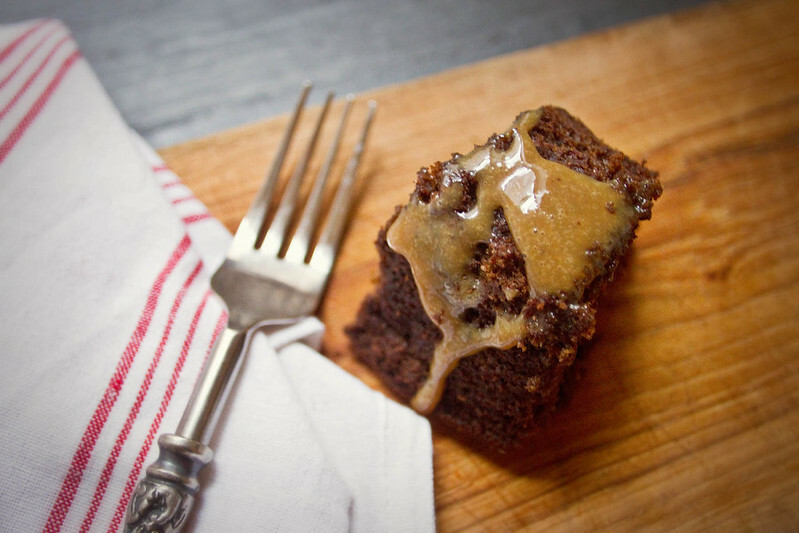 The fresh ginger and molasses are the strongest flavors, but the medlar (or apple, up to you), is not lost in the cake at all, I found my medlar flavor came in bits and bursts of creamy applesauce taste. 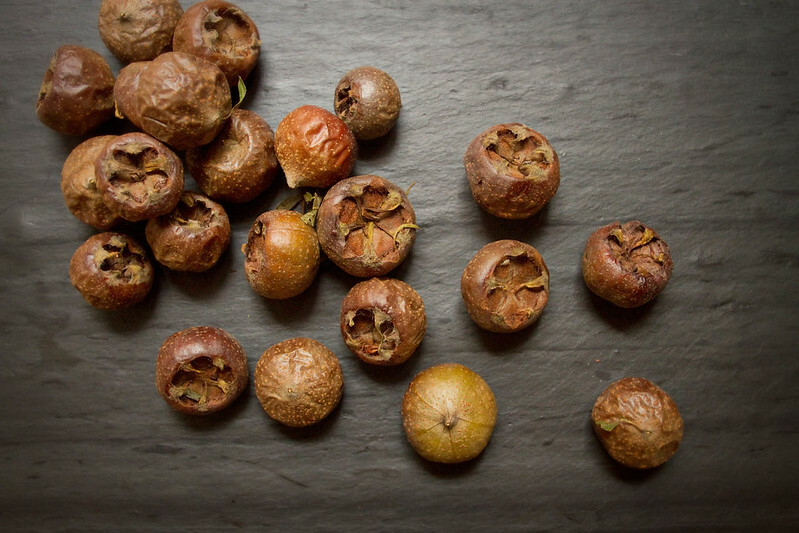 What is a Medlar? You may be wondering. A medlar is a delightful fruit. It's quite an old fruit, everyone from the ancient Romans to the medieval Brits have enjoyed the medlar. 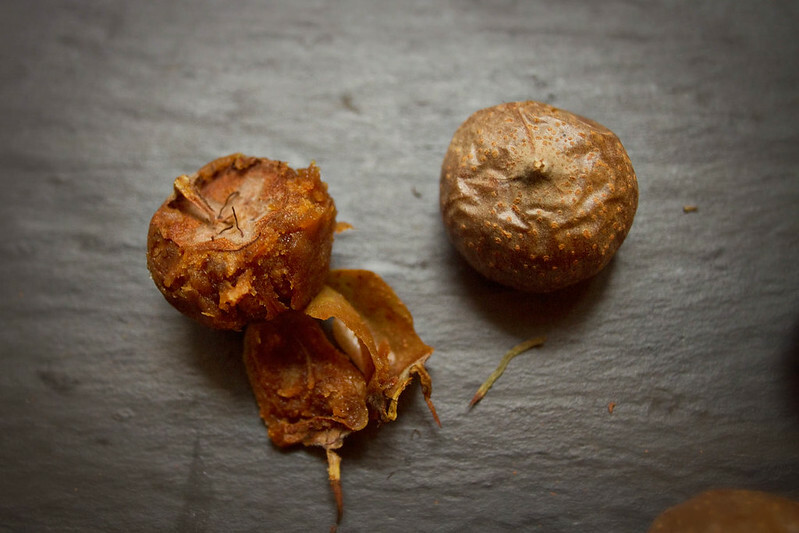 Shakespeare wrote about the medlar in several of his plays, but what he had to say about it was a bit, uhm, naughty. Apparently Shakespeare thought medlars looked a bit like a ladies... well, bits. As a lady, however, I'm not sure I see the likeness. And I've very recently looked at a lot of medlars. Anyway, literary references and innuendos aside, I assure you the medlar is a wonderful fruit. 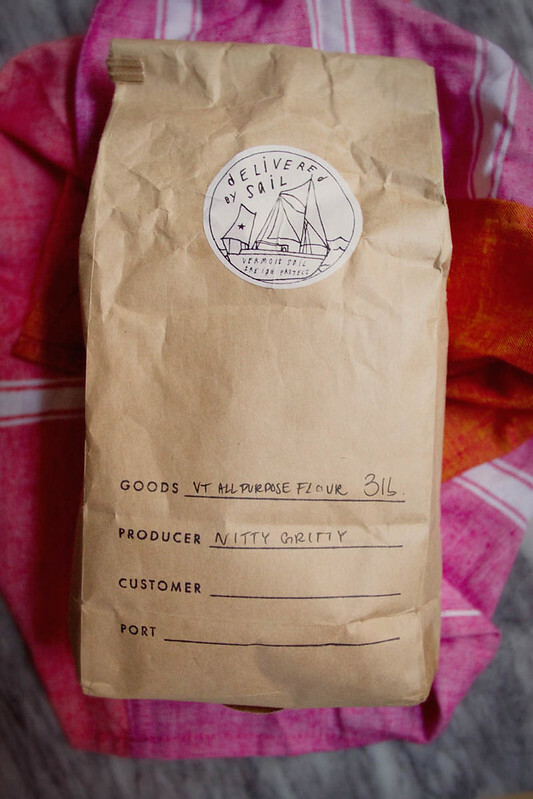 I've had two opportunities to bring some home, both times from Maggie Nesciur of Flying Fox's fruit stand at New Amsterdam, the best darn market in town. Medlars are a small fruit, brown and hard when harvested, but you must blet them before eating them. Bletting is a process of over-ripening the fruit. It's very easy, simply arrange them, upsidedown, on a cookie sheet and set it somewhere fairly cool until they're all very soft on all sides, which took mine 1 week the first time I had medlars, but over 2 weeks this time. Then you can cook with them. 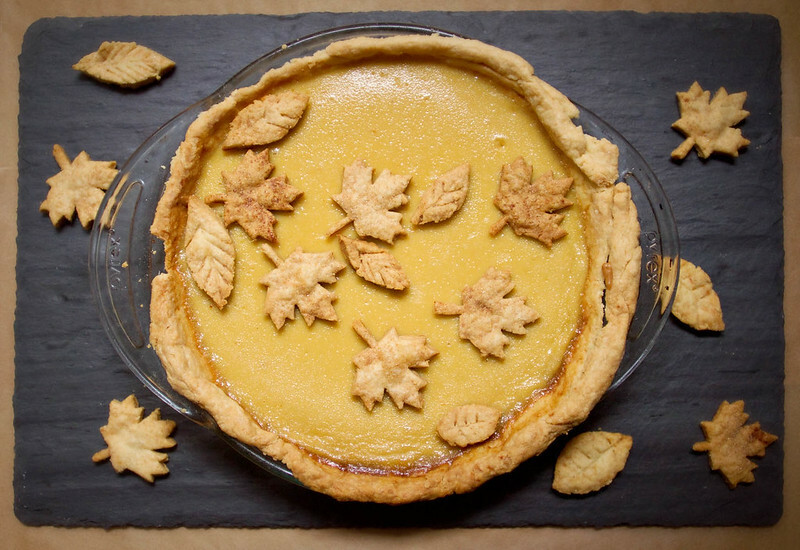 Or just peel and devour them because they taste like cinnamon-creamy-applesauce-pie-heaven. 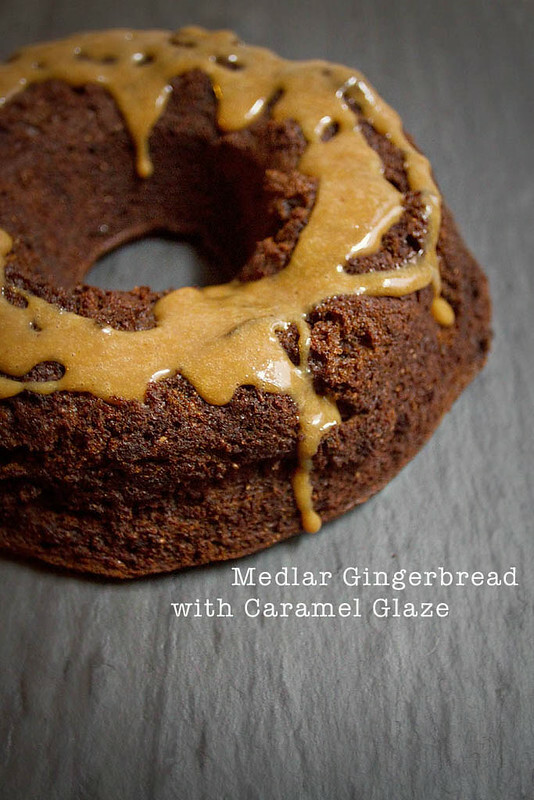 I know I said this was my month of Thanksgiving, and I know gingerbread probably seems a bit more Christmas than Thanksgiving, but I assure you this is a lovely dish for Autumn as well, especially with the caramel sauce drizzled over top. Also, Christmas is coming, guys. It's coming. 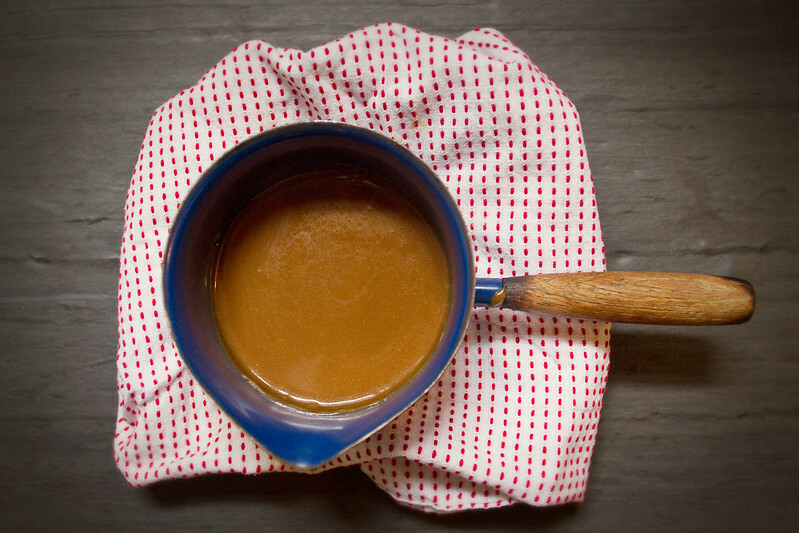 If tracking down medlars and waiting for them to blet doesn't sound like a great time to you, applesauce will make a fabulous substitution, which I why I'm providing my go-to slow cooker maple applesauce recipe which makes a vat of dark golden brown, maple swirled apple goodness, it's at the bottom of the page. 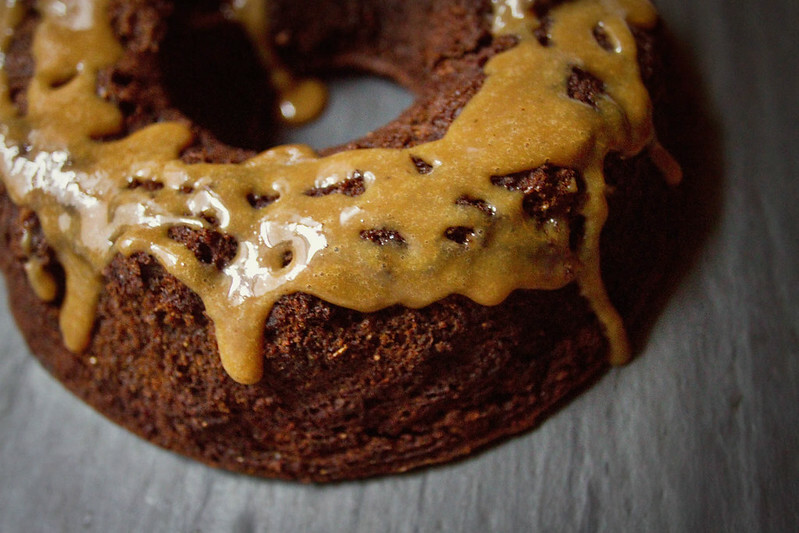 This recipe will make 1 large bundt cake or two smaller cakes. I made 1 small bundt and 1 small rectangular cake. 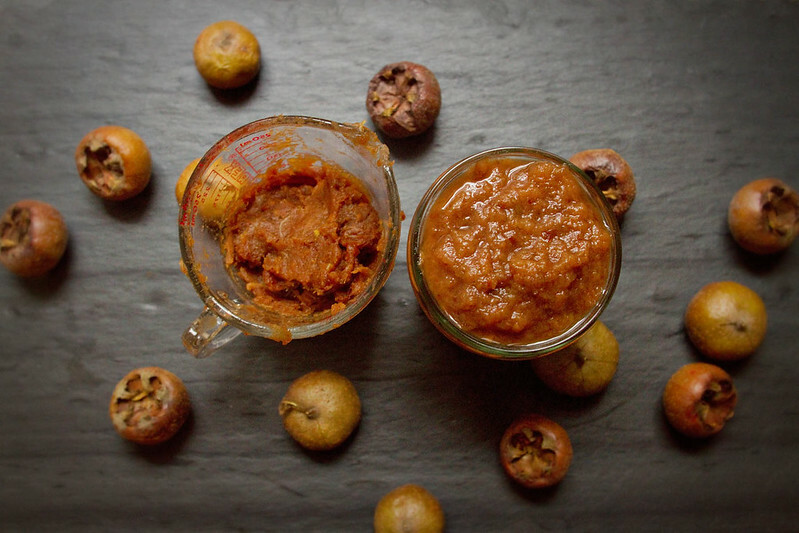 Medlar flesh is like a paste consistency, or super thick apple butter. I used about two pounds of Medlars. Make sure yours are thoroughly bletted (allowed to overripen). 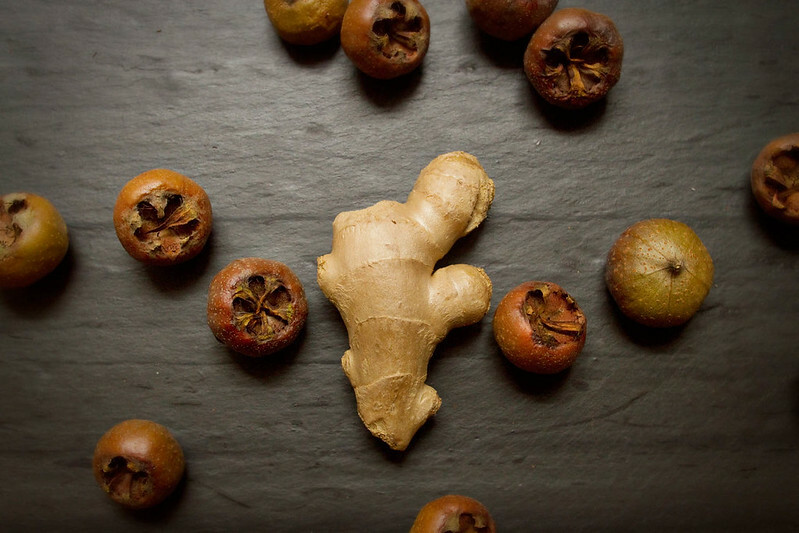 Medlars are best when very soft, the inside should the consistency of applesauce, and will also smell like lovely cinnamon applesauce. To blet the medlars place them top down on a cookie sheet and sit them near a cool window until very soft. This took my medlars about two-three weeks. Once bletted, peel your medlars (this is pretty darn easy, the skin is soft and thin), and separate the flesh from the skin and seeds. This is tougher. Most of the medlar is seed, but the flesh grows around and between them. I found it easiest to completely peel the medlar, then run my thumb between each seed and extract the flesh. Put all the flesh into a measuring cup to keep track of how much you have. I also tried to remove as much flesh from the skins and seeds as possible. I peeled and defleshed about 20 medlars for this recipe (all my ripe ones), and got about 3/4 cup of medlar fruit. 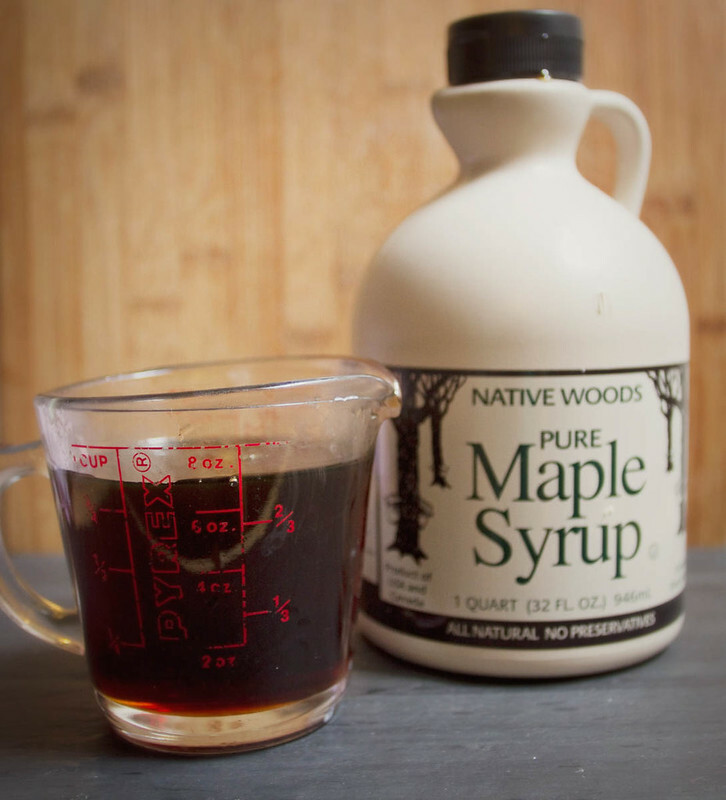 Supplement with applesauce if needed to bring the measurement up to 1 Cup. Grate your fresh ginger. You can do this with a ginger grater, or my personal favorite, a microplane (I bought mine about a year ago, and I'm in love with it, and the short work it makes of hard vegetables and cheeses). 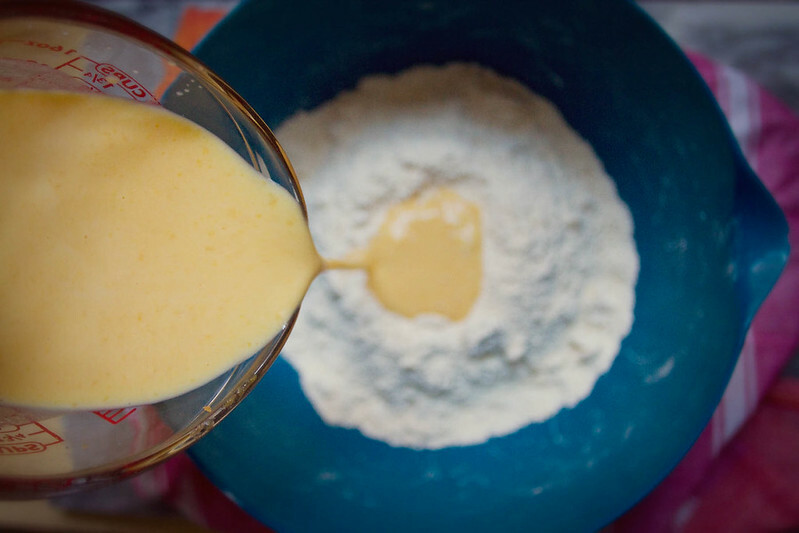 Cream together the butter and sugar in a large bowl with a stand mixer, fork, or a hand mixer. Add the medlar flesh or applesauce, and molasses, mix again. Add the eggs and spices, mix again until well combined. Add water, and beat until well incorporated. 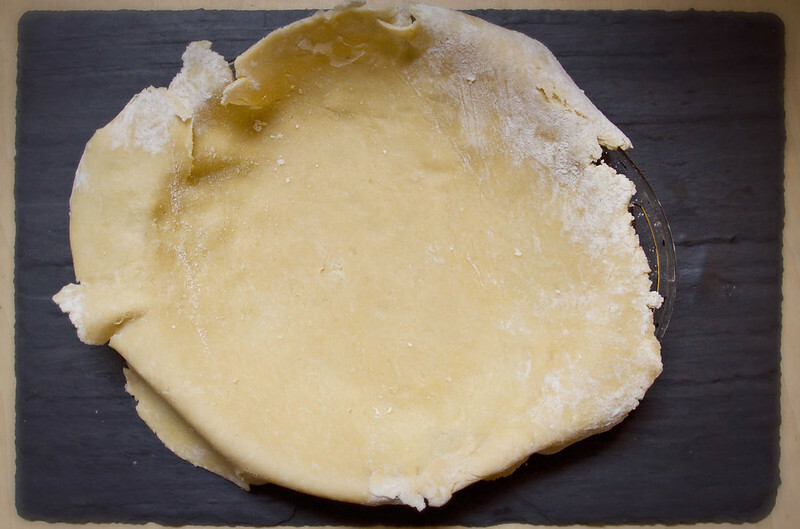 In a separate bowl combine flour, salt, and baking soda. Mix well with a fork until thoroughly blended. Slowly add the dry ingredients to the wet while mixing on low speed. Scrape the sides of the bowl and mix again until all ingredients are incorporated. Try not to over mix. 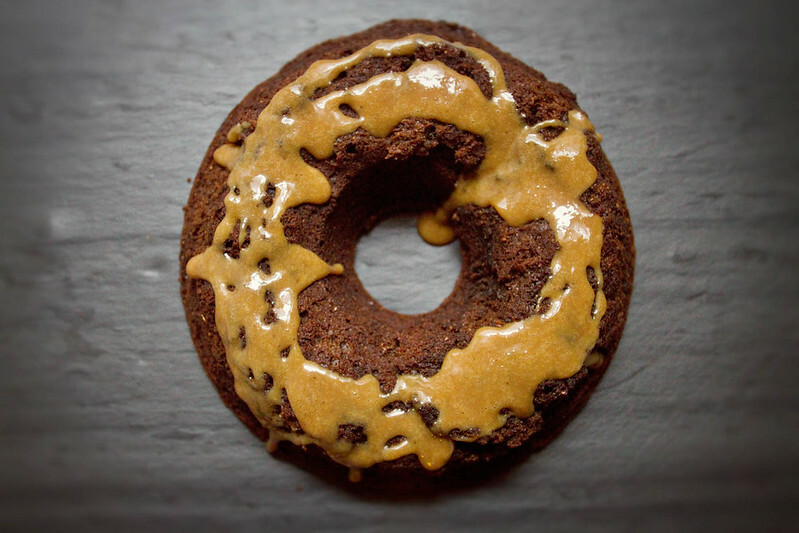 Pour into a well greased bundt pan and bake 45-55 minutes, until a toothpick inserted into the center comes out clean. Let mostly cool before pouring on glaze. 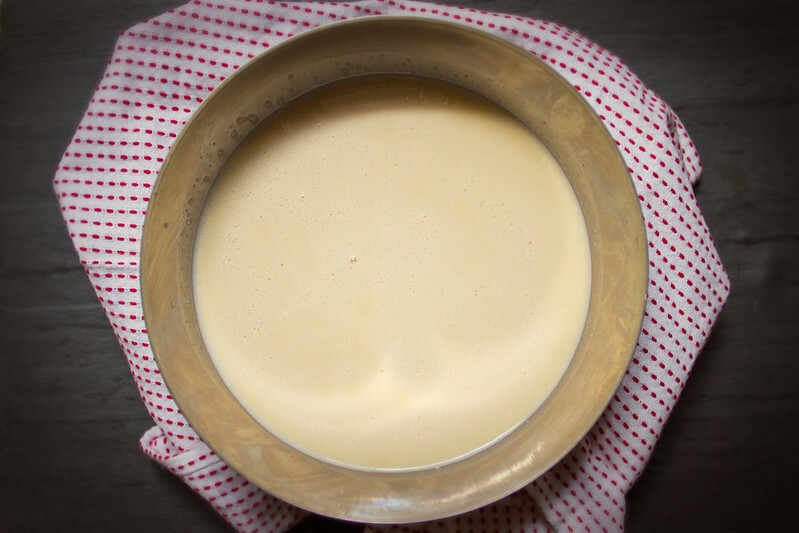 Add the cream, butter, and brown sugar to a saucepan and mix over low heat, whisking until the butter melts and the brown sugar breaks up into the milk, then turn heat to medium and cook 6-8 minutes, whisking continuously, until it's thickened up to a nice glaze consistency. Set aside to cool. If you prefer your apples peeled, you may peel them. I don't peel mine, and find that once blitzed, the skins are undetectable in the sauce, however I never peel my apples in any recipe, so if you prefer a peeled apple in baked goods, feel free. Chop apples into 1x1 inch pieces and toss them in your crock pot along with the water and syrup. Set your slow cooker to low and cook for 6-7 hours. Remove any excess liquid (leave a bit though, just don't allow the apples to be swimming in it) then, if you prefer a chunky apple sauce, mash it up with a large spoon. 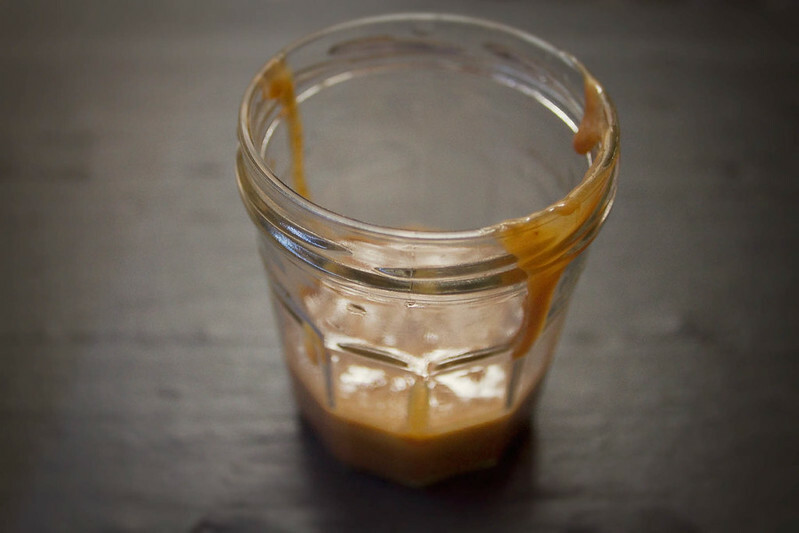 If you prefer it smoother, pour the mixture into a blender/food processor and blitz until smooth. 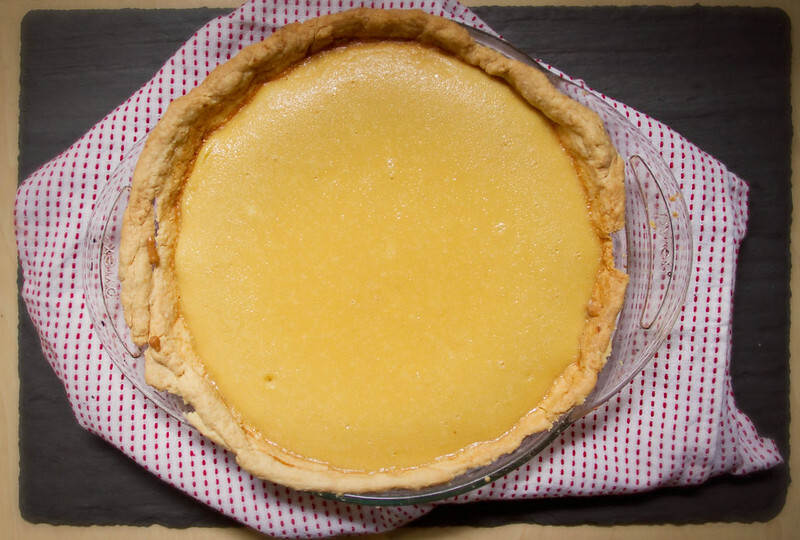 I did mine in my food processor for about 1 minute, and it came out mostly smooth. Eat it hot, or pop it in your fridge. It should last up to a week in there. It has been five years since I was with my family for Thanksgiving. It's hard, logistically and monetarily, to make it home twice in two months, so I've always prioritized Christmas (the king of all holidays), and consequently I've had some interesting Thanksgivings. There was the year in Olympia my best friend and I roasted a Turducken with our classmates, only we put a cornish game hen inside the chicken, inside the duck, inside the turkey. So we called it Feastsgiving, the Four Fowled Feast, and it was amazing. There was the year I went to Montreal with S and his family to see his brother, and used my broken high school French to buy the pies for dessert at a tiny little bakery. We created a full Thanksgiving feast and ate it with his brothers Canadian roommates. There was also one year where I sat alone in a dorm room with my broken leg in a cast while my then-boyfriend hung out on his friend's family's private island in the Puget Sound. That was the first, and indisputably worst, year. This year, again I will not be going to Cleveland, but my mother will be coming here! It will just be S, my mother, and me for Thanksgiving, so we're going to roast the smallest turkey we can find, and I suspect I will have quell my desire to make atleast ten side dishes, lest we end up with a fridge so full of leftovers we cannot close it. Consequently, I have declared the month of November Thanksgiving Month. 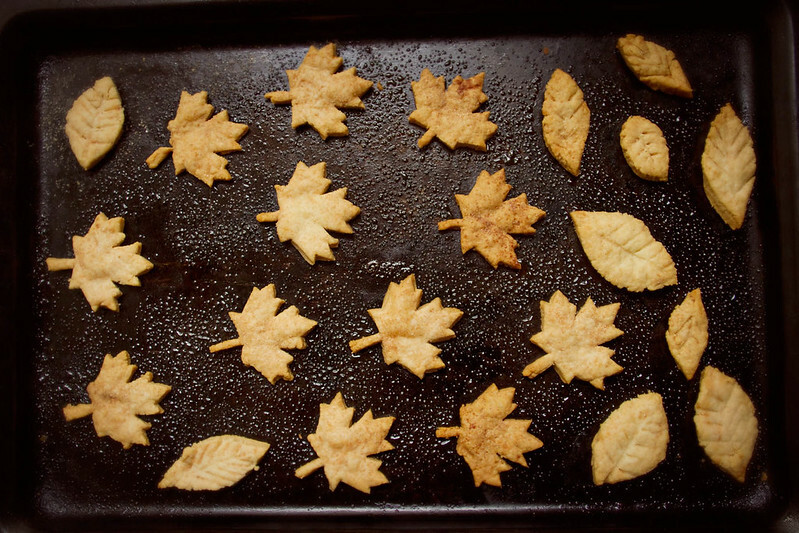 All month I shall be making, and posting, Thanksgiving themed sides, appetizers, desserts, and baked goods. I shall make a complete, delicious, vast Thanksgiving feast, one dish at a time, and share it all with you. 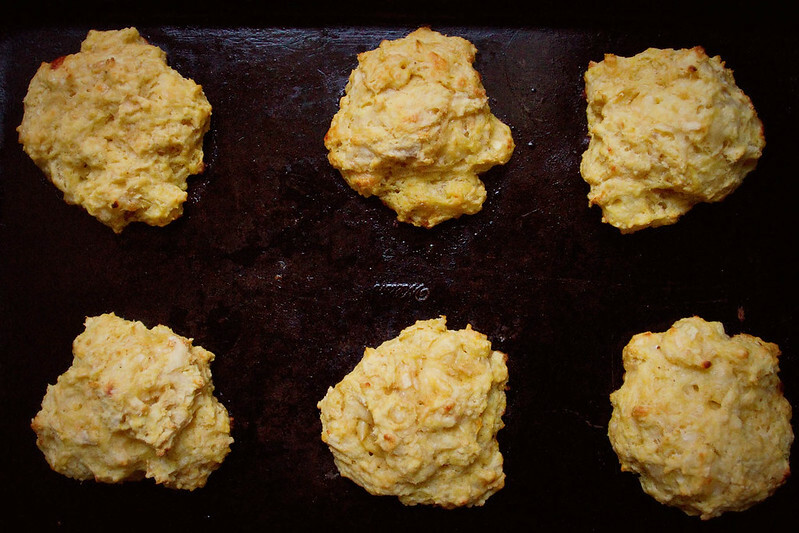 Beginning, deliciously, with these biscuits. 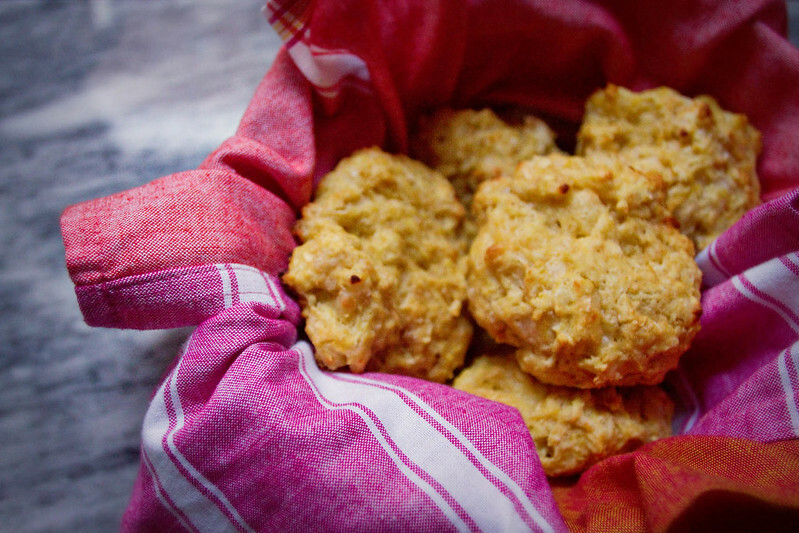 These biscuits, made with grated cheddar, pumpkin puree, and Kerrygold Dubliner cheese, are heavenly. 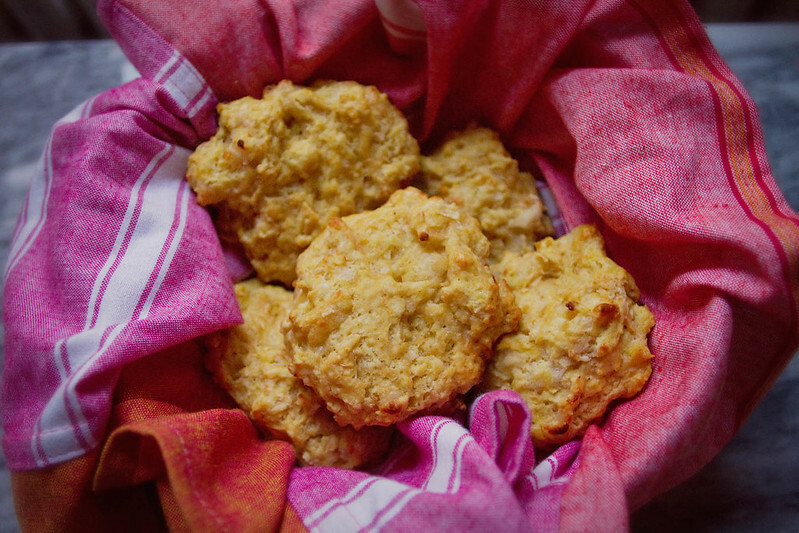 The consistency is on par with a regular drop biscuit, though a bit moister due to the apple. S thought the extra moistness was their crowning glory, but I thought it was the subtle hint of nutmeg mixing with the cheese. 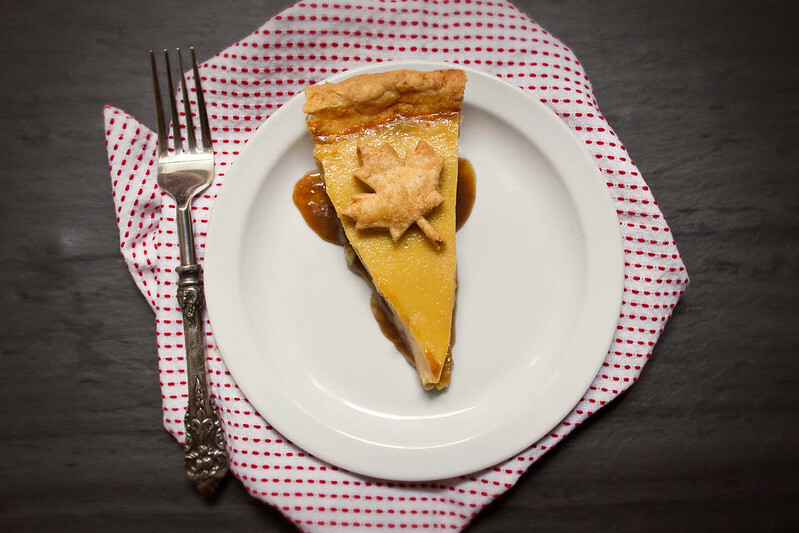 The pumpkin, of course, tastes of earthy, semisweet autumn flavors, augmented by the sweet and tart apple, while the cheese melts luxuriously in little pockets, creamy and delightful. These are great with dinner, and would be a phenomenal substitute for the usual Pillsbury dinner rolls in a Thanksgiving spread! 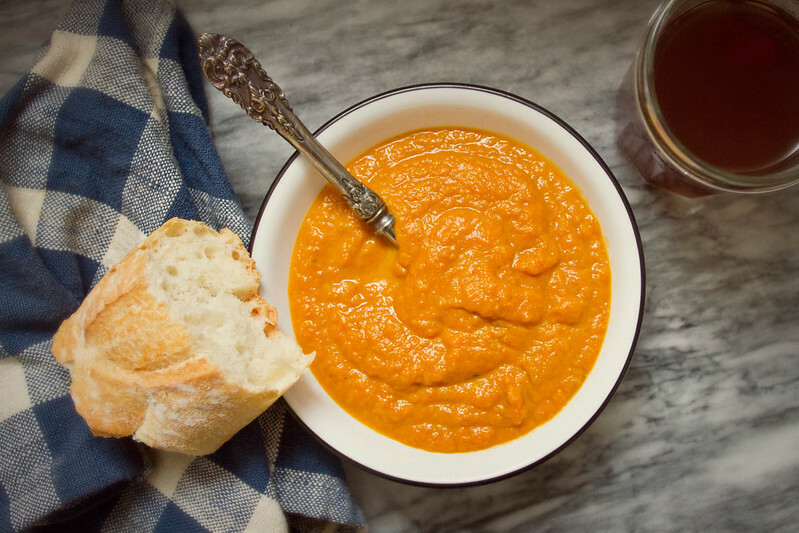 You can use canned or homemade pumpkin puree in this recipe. 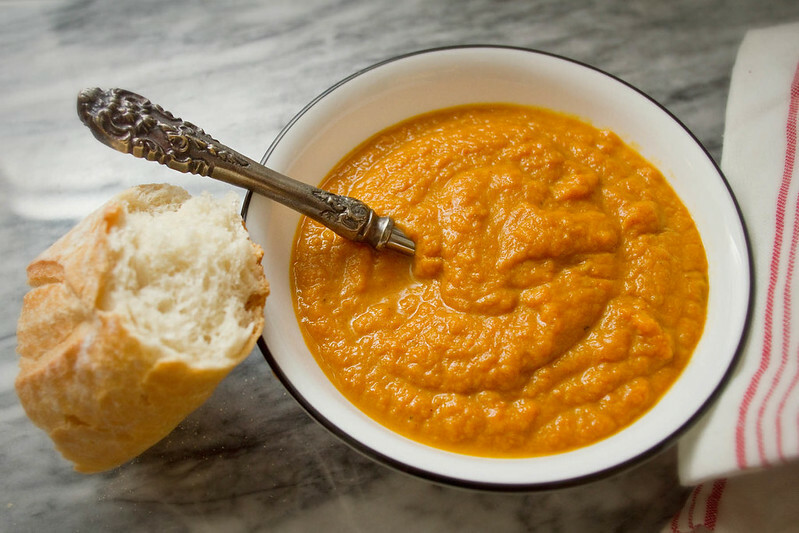 I have provided the recipe for my homemade pumpkin puree below, which is what I used. 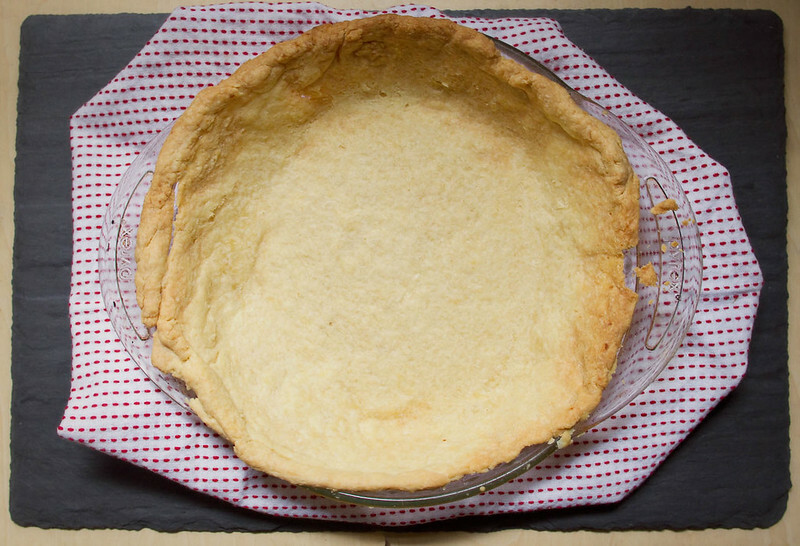 In a large bowl combine flour, baking powder, baking soda, salt, nutmeg, and ginger. Mix well with fork to combine. 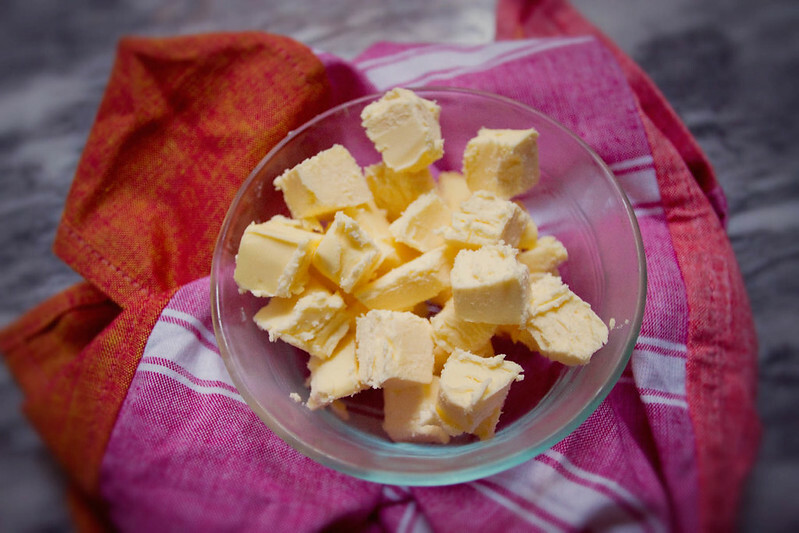 Cut in butter with two forks, your hands, or pastry cutter until mixture resembles coarse crumbs. 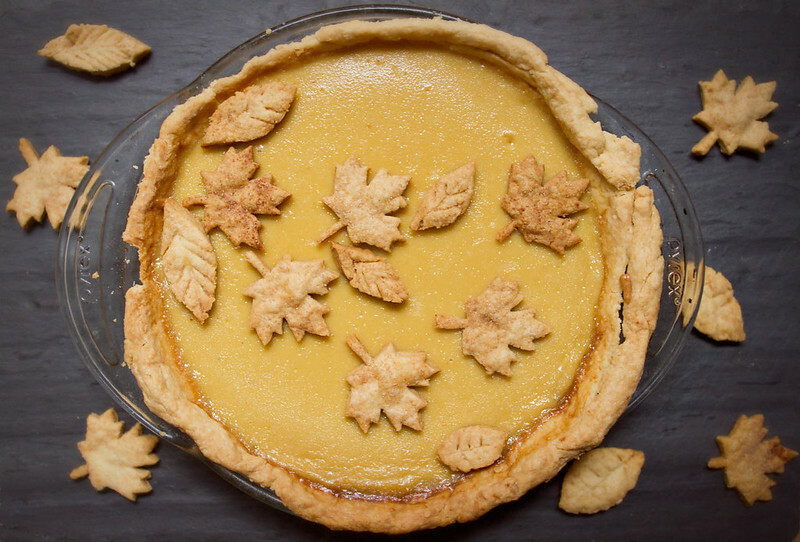 In large measuring cup, combine buttermilk, honey, and pumpkin puree. Mix until well combined. Stir in pumpkin puree mixture until flour is just moistened. Gently stir in grated apple and cheese. 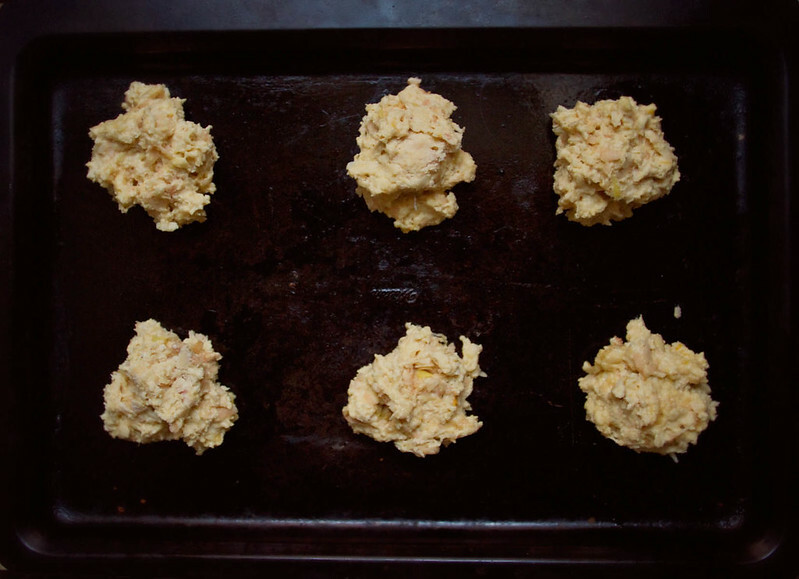 Use a large table spoon to scoop out the biscuits and drop them onto a greased pan. 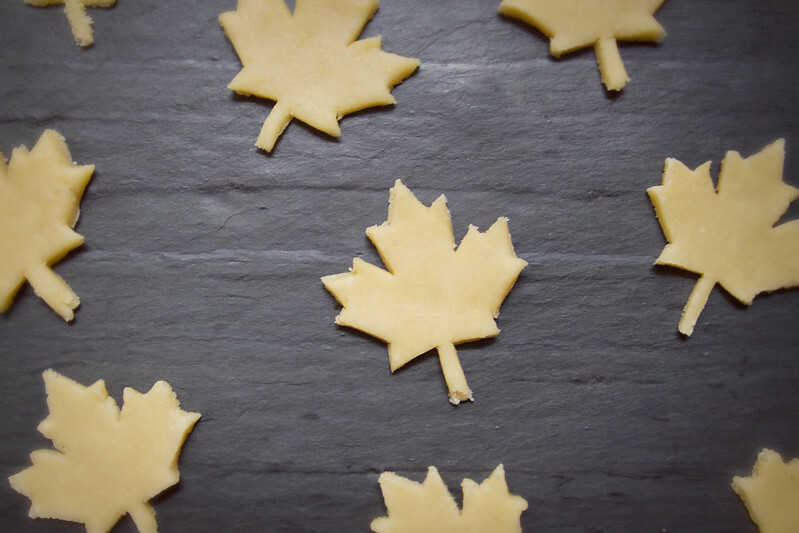 These are delicious served warm with butter, jam, or I imagine they would be amazing with apple or pumpkin butter! Cut one small pumpkin into halves, scoop out the seeds and stringy bits. Cut the halves in half, and bake in a 250 degree fahrenheit oven for 45 minutes, or until pumpkin flesh is soft when poked with fork. Remove from oven, allow to cool, and scoop the flesh out of the skin. Place in a food processor, and if you're like me and prefer it a bit thinner, add about 1/4C of apple cider. Process until smooth.